Team India skipper Virat Kohli has credited his prolific run of form with the bat to his captaincy, saying that the added responsibility has left no room for complacency in his batting. 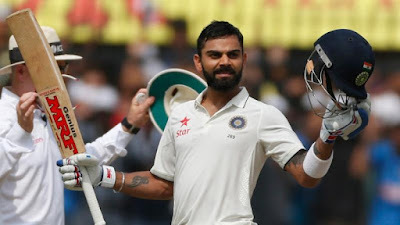 Kohli on Friday completed a double century on the second day of the one-off Test against Bangladesh in Hyderabad, scoring 204 to help India reach a commanding total of 687/6. This was the captain's fourth double ton in Test cricket, with all four of them coming after he was given charge of the team in the longer format of the game. "I don't know, I think it is because of captaincy that you tend to go on more than what you usually would as a normal batsman. I think the room for complacency is no more present when you become captain. So, that has something to do with me playing long innings," the 28-year-old right-handed batsman said. "I have always wanted to play long innings and my first seven or eight hundreds were not even 120 plus scores. After that I made a conscious effort to bat long and control my excitement or not be complacent at any stage," he was quoted as saying by 'bcci.tv', when asked about his hunger for big scores. With his 204-run knock, Kohli became the first batsman in the history of Test cricket to claim four double hundreds in as many series. In the process, he surpassed the legendary Sir Don Bradman and Rahul Dravid, both of whom had three double hundreds in successive series. Kohli's four double hundreds have come against West Indies (200), New Zealand (211), England (235) and now Bangladesh. The Indian captain said that he's is no longer satisfied with Test hundreds and his fitness level allows him to play for longer innings and eye bigger scores. "I worked on my fitness level over the years and I feel I can go for longer periods now. I don't get tired as much as I used to before. Definitely, I don't get satisfied when I get a Test hundred which used to be before, because I used to give too much importance to Test cricket separately. Now I have started to treat it as any game of cricket and I have to keep going on till the time the team needs to," said the Delhi batsman. Asked how he has been able to maintain consistency across the three formats, he said, "It is not easy to do especially with the amount of cricket we play nowadays. It is more of a mental thing. I don't necessarily focus too much on practice because sometimes you might not get to practice so much.